Valid then, even more so now. Photo by MOVADUP. With the Comptroller General’s audit about to be released, the University of Panama’s rector with the fake doctorate, Mr. Gustavo García de Paredes, convened an urgent and unpublicized meeting to confer civil service protection on hundreds of his political patronage hirees before his term in office ends. Then the Comptroller General issued his report and sent it to the Attorney General for criminal investigation. 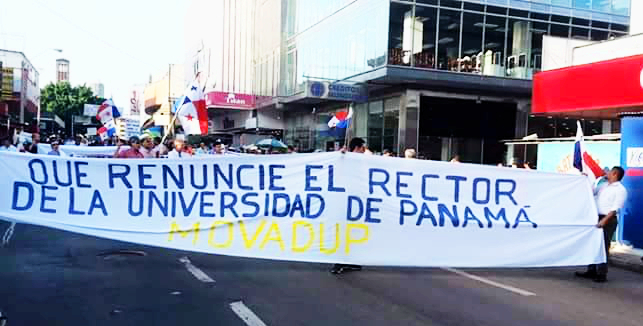 The “private” University of Panama Foundation that García de Paredes created to receive university funds has at least $490,000 missing, and the audit is just of recent years rather than all the way back to the foundation’s establishment. The self-proclaimed “Rector Magnifico” presents a grave risk that yet more evidence will be destroyed or concealed so long as he remains in office. Among the nearly two dozen people named by the comptroller’s report there are two candidates in the crowded field of those who hope to succeed García de Paredes as rector. They, too, should be suspended from the university and barred from its campuses pending further investigations. 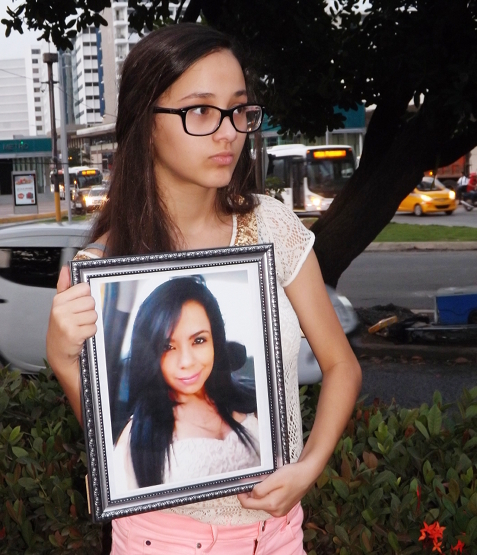 Not to be forgotten, not to be defamed: law student Vanessa Rodríguez’s family and friends, and Panama’s women’s organizations, were dignified in their insistence. Photo by Eric Jackson. Omar Vélez has been found guilty of the second degree murder of Vanessa Rodríguez. It’s an awful tragedy, the stuff of which good true crime writing is done. But it’s also a just and accurate verdict by the court-martial jury at Fort Bragg, which upheld the truth, the Uniform Code of Military Justice and the reputation of the US Armed Forces. The young law student’s slaying by the US Army master sergeant does, however, leave questions that Panama’s powers-that-be will surely ignore but the Panamanian people just as surely ought to ask. What benefit is it to Panama to have our lince rapid-response motorcycle police trained in military tactics? What are the specific terms of the Status of Forces Agreement with the United States that gave diplomatic immunity to Vélez — whom does it cover and how many such covered people are in Panama? Why is Panama so doggedly pursuing made-in-the-USA “War on Drugs” policies when at almost every opportunity US voters are rejecting that failed set of laws, practices and expenditures? A “roid rage” murder by a US anti-drug warrior sent to Panama under cover of diplomatic immunity might be just a sad curiosity were there not a serious steroids problem in the US Armed Forces. That problem is one of the symptoms of the endless wars in Afghanistan, Iraq and so many other places around the world. It’s not unpatriotic to acknowledge it, and it’s not patriotic to just write it off as a matter of a few undisciplined soldiers and treat it only as a criminal justice issue. It is an urgent matter of US national security to address the many social problems among the weary and demoralized forces who have been sent on open-ended missions to fight inanimate concepts, among their many dependents, and among the veterans who have come back from these wars on terror, drugs and so on. Yes, the Vélez case was a garden variety murder that rightly had to be addressed by a criminal court, but it was also an alarm about more widespread problems that should not be ignored.